Last month we compared two modem/ interface packages in the £150 bracket. For many people this comparison will be irrelevant, since they simply don't have that much money available for peripherals. If you fall into this category but are still keen to get telecomputing, Cirkit may have just the package for you. The price includes modem, interface and software. The modem is the old acoustic coupler Protek 1200. (The '1200' refers to the fact that it supports only the Prestel communications standard baud rate of 1200/75, but that'll be enough for many users.) Rather than plugging the modem into a phone socket, you have to plug the handset of your phone into a pair of rubber sockets built into the modem. This places serious restrictions on the type of phone you have to have. While the modem is flexible enough to cope with small variations, the phone must be of the traditional BT type to fit the sockets properly. Trimphones and the like are no use at all. The other classic problem with acoustic coupler modems is that of outside noise being picked up by the handset. The modem does not make any electrical connection with the phone system - it transmits and recieves information by making noises into the mouthpiece and listening to the earpiece. Just like a human conversation, this information exchange can be disrupted if the level of background noise gets too high. The review copy behaved itself perfectly well, however, with no interference to speak of once the handset was firmly plugged in. The interface slots on to the expansion port, and the review copy proved to be a very tight fit indeed. The connector is meant to align itself by way of a small plastic key engaging in the expansion port notch. Unfortunately the key stuck fast in the notch, staying behind when the interface was removed. In practice the key is quite unnecessary for the purpose of alignment, and the connection made was perfectly sound. The interface's designers, Honeysoft, also wrote the bundled software. Though obviously not in the same league as their excellent Honeyview and Honey term programs, this is a solid and workmanlike product far above the standard the package's price tag would suggest. In action the system proved easy to use, and quite adequate for most PRESTEL activities. If you want to download telesoft-ware or get hard copy, however, you'll need extra software at around the £20 mark, but the basics are there. 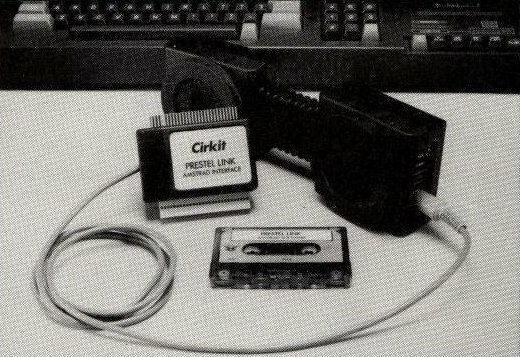 The software also provides for you to exchange data directly with another Cirkit user, though I didn't have a chance to check this side of the system. A very basic system, then, but it seems to work well. The modem is battery powered, and this has attracted quite a bit of criticism. The only real drawback to my mind is the need for a particular shape of phone. 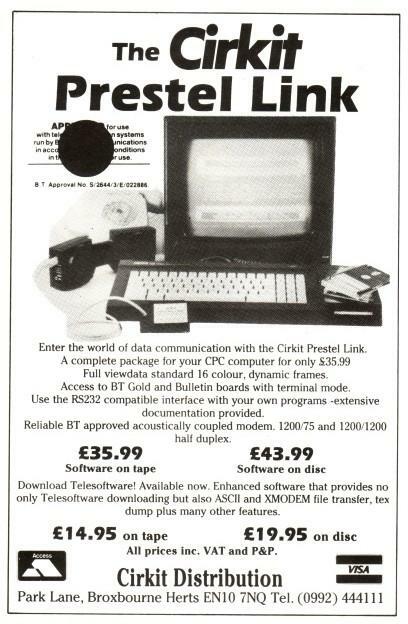 Telecomputing can be an enjoyable hobby, but £150 is an awful lot to pay, especially considering that there'll be PRESTEL and BT charges as well. Cirkit have brought the set-up price within reach if the package is a bit rough and ready, that's only to be expected. Complete package consists of Modem, Interface, Software and connection lead. Fully compatible with the CPC464, CPC664 and CPC6128. 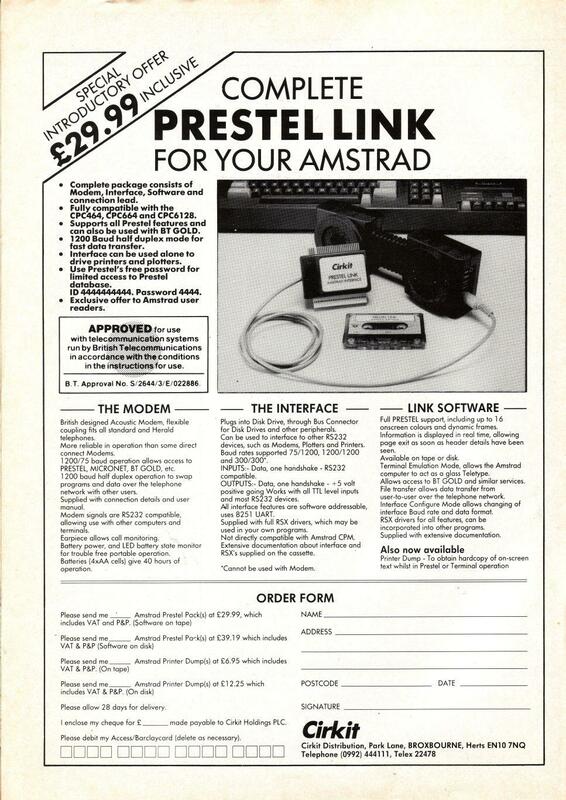 Supports all Prestel features and can also be used with BT GOLD. 1200 Baud half duplex mode for fast data transfer. Interface can be used alone to drive printers and plotters. Use Prestel's free password for limited access to Prestel database. ID 4444444444. Password 4444. 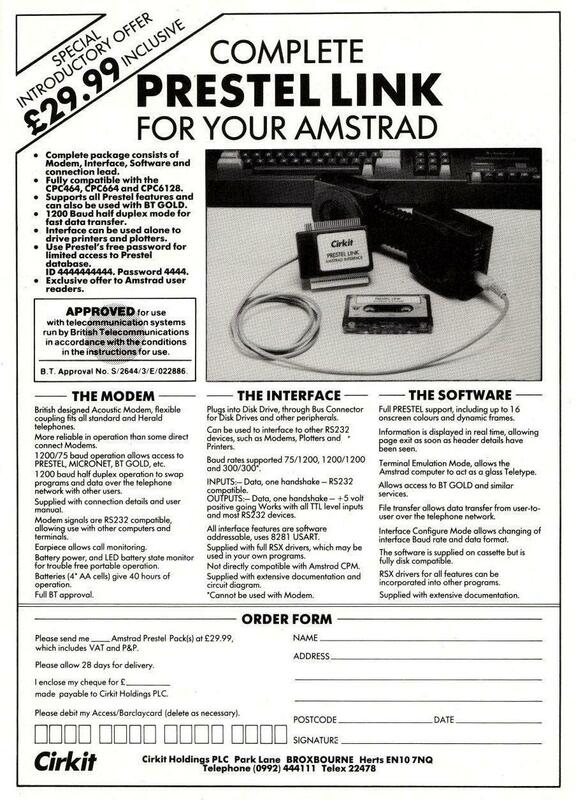 Exclusive offer to Amstrad user readers.